Hello friends. 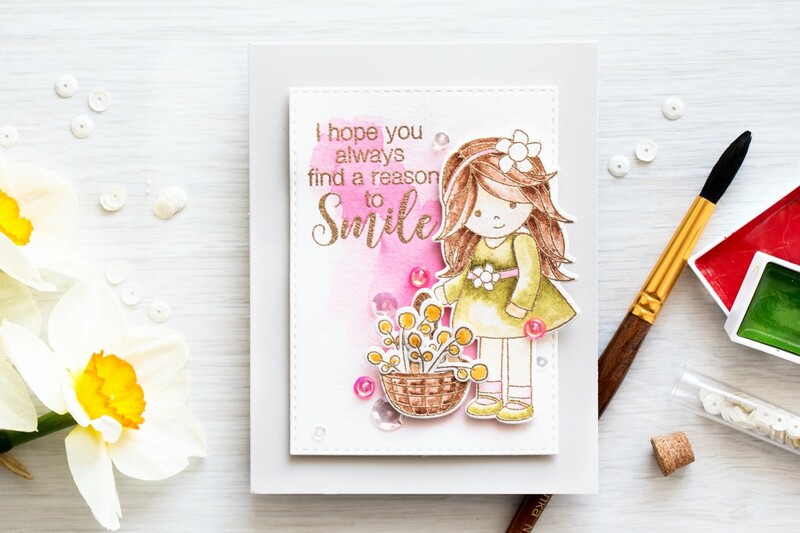 I was playing with my stamps from Simon the other day and I really wanted to use the Melody’s Easter Set to create a card, but I didn’t want it to be an Easter one since is already too late for that this year. So that got me thinking, what can I do to use the lovely girl image and the basket, but turn this into an every day project? The solution is simple – replace eggs with flowers! 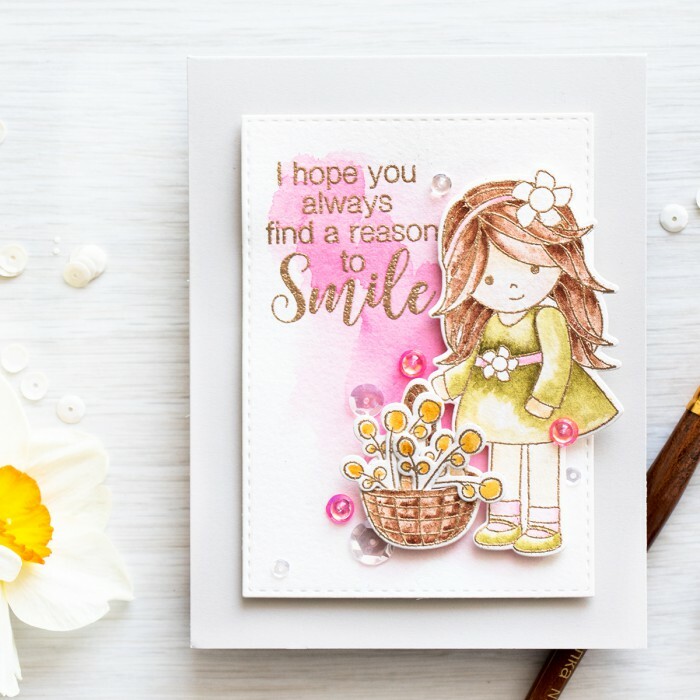 I stamped and heat embossed the little girl, basket and several flowers from the Daffodils set in Simon’s Antique Gold embossing powder onto Arches Cold Press Watercolor paper. Usually I like to emboss in white, but I have found the Antique Gold and Rose Gold (or simple Gold) embossing powders to be such a better option, especially for heat embossing people (that makes coloring hair a lot easier and the final image looks better). I used my Kuretake Gansai Tambi Watercolors and colored my images using browns, green, pink and a bit of yellow. I am not very skilled at coloring people, but I’ve really enjoyed it and I love the way it turned out. I replaced the eggs with 4 die cut flower sprigs. I used my craft knife and just sliced the basket and handle open to be able to insert the flowers. I also created a watercolor panel with a beautiful everyday sentiment and a wash of pink watercolor. The little girl and her flower basket were foam mounted on top. 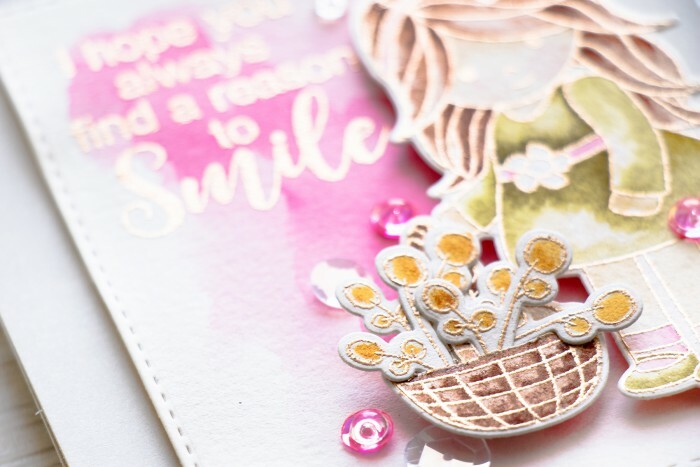 The panel was then foam mounted onto a light gray card base and decorated with several clear drops and strawberry sequins from Pretty Pink Posh. As usual, very nice card ! I love the way it looks with Simon’s Antique Gold embossing powder. Thanks for sharing. I really enjoy the overall feeling of this card. Rather unique. Adorable card. Love all that gold. This card is so lovely!!! Great coloring! 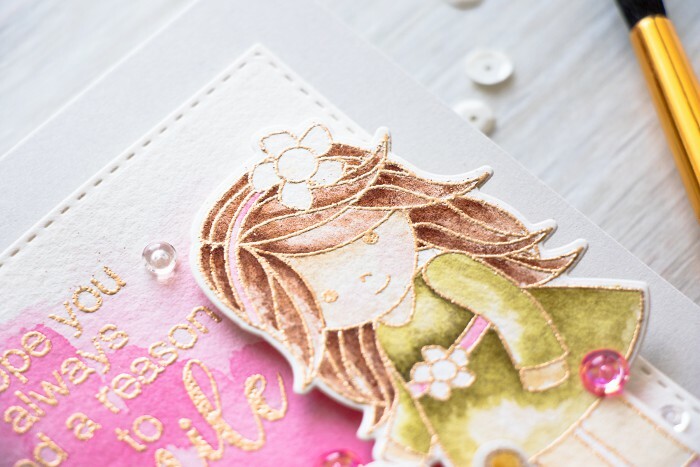 Love gold embossing! Such a great touch!